An unmanned Delta 2 rocket launches the Italian COSMOS-Skymed 4 satellite from Vandenberg Air Force Base in California on Nov. 5, 2010. It was the 350th launch of a Delta 2 rocket. Thenext generation of NASA remote sensing satellites and space scienceprobescould be burdened by rising launch costs and delays as the agencyincorporatesnew medium-lift rockets, according to a Government AccountabilityOffice reportreleased Monday. Theuncertainty surrounds 12 to 14 science missions through 2020 that havenot yetreceived launch vehicle assignments, the governmentwatchdog report said. NASAis ending its use of the Delta 2 rocket, a workhorse launcher that hasdelivered nearly 60 percent of the agency's scientific satellites tospacesince 1998. Butthe Falcon 9 and Taurus 2 are not certified to launch NASA's mostexpensive andimportant science missions. UnitedLaunch Alliance has three more NASA missions on its Delta 2 manifest.Parts forproducing five more Delta 2 rockets are also available, but there arehighcosts of modifying and maintaining launch pads to host any extraflights, accordingto the GAO. 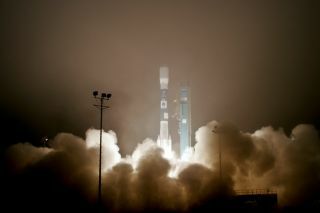 Thereport addressed NASA's efforts to support the remaining Delta 2flights andthe agency's medium-class launch strategy. "NASAis taking an appropriate approach to help ensure the success of theremainingDelta 2 missions by adequately addressing workforce, support, andlaunchinfrastructure risks," the report said. "Nevertheless, an affordableand reliable medium launch capability is critical to NASA meeting itsscientific goals." Mostof the medium-class missions in NASA's portfolio are Earth observationsatellites, which require polar orbit launches from West Coast sites atVandenberg Air Force Base, Calif., or Kodiak Launch Complex in Alaska. Neithercompany has an operational West Coast launch site. SpaceX plans toconstruct a Falcon9launch pad at Vandenberg, and Orbital is still evaluating potentialsites forpolar Taurus 2 missions. Thefirst NASA decision point is expected in the next few months. NASA mustdecideon a launch vehicle for three Earth observation satellites in 2011. Themissions are due for liftoff in 2014 and 2015. NASAis expected to settle on a rocket for the Soil Moisture Active andPassive, orSMAP, satellite by March. Other civil space missions scheduled forlaunch by2015 and still lacking a launch vehicle assignment include the ice-mappingICESat 2 spacecraft and the first member of NOAA's revampedpolar-orbitingweather satellite fleet. TheFalcon 9 and Taurus 2 are already under NASA contracts to supply cargoto theInternational Space Station beginning in 2011 or 2012. The LaunchServicesProgram, which manages launch contracts for NASA's robotic missions,has notyet awarded a flight to either rocket. TheFalcon 9 is part of a NASA Launch Services contract announced inSeptember thatsets the pool of rockets available for the agency's unmanned missions.Orbitalplans to add the Taurus 2 to NASA's mix of launch vehicles in 2011. Competitionsto launch individual spacecraft result in a task order that NASA issuesto aspecific booster. The certification process for the Falcon 9 rocketwill beginwhen it receives its first task order, and the GAO predicts the Falcon9 couldbe deemed ready to launch NASA's high-priority payloads by late 2013,assuminga contract award in early 2011. TheTaurus 2 is not eligible for a task order until it becomes part of theNASALaunch Services contract, which is not expected until at least late2011. TheGAO report said NASA officials estimate it will cost about $25 millionand takeabout three years to certify each new rocket, assuming there are nosignificantdesign changes or additional testing required. "NASAhas a plan in place for obtaining this capability through Orbital andSpaceX'svehicles, but past experience with other development programs andrecenthistory with both vehicles indicate that maturing and certifyingthese vehicles for use by science missions is likely to provemoredifficult and costly than currently anticipated," the report said. Thecertification costs will be passed on to NASA's science missiondirectorate andcould be assigned to the first mission to use a new rocket or spreadoverseveral projects, according to the GAO. Thewatchdog agency also warned of potential launch delays stemming fromsetbacksin rocket development or the certification process. "WhileNASA expects these vehicles will eventually become a viable option formediumclass science missions, it is uncertain how long the process mighttake,"the report said.